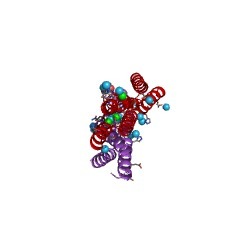 The protein G-related albumin-binding (GA) module is composed of three alpha helices (PUBMED:9086265). This module is found in a range of bacterial cell surface proteins. The GA module from the Peptostreptococcus magnus albumin-binding protein (PAB) shows a strong affinity for albumin. Protein G-related albumin-binding (GA) modules occur on the surface of numerous Gram-positive bacterial pathogens. Protein G of group C and G Streptococci interacts with the constant region of IgG and with human serum albumin. The GA module is composed of a left-handed three-helix bundle and is found in a range of bacterial cell surface proteins [(PUBMED:15269208), (PUBMED:9086265)]. GA modules may promote bacterial growth and virulence in mammalian hosts by scavenging albumin-bound nutrients and camouflaging the bacteria. Variations in sequence give rise to differences in structure and function between GA modules in different proteins, which could alter pathogenesis and host specificity due to their varied affinities for different species of albumin [(PUBMED:16906768)]. Proteins containing a GA module include PAB from Peptostreptococcus magnus [(PUBMED:7589548)]. This entry represents the GA module from the extracellular matrix-binding protein ebhB. There are 16028 GA domains in 755 proteins in SMART's nrdb database. Taxonomic distribution of proteins containing GA domain. This tree includes only several representative species. The complete taxonomic breakdown of all proteins with GA domain is also avaliable. Click on the protein counts, or double click on taxonomic names to display all proteins containing GA domain in the selected taxonomic class. Solution structure of the albumin-binding GA module: a versatile bacterialprotein domain. The albumin-binding GA module is found in a family of surface proteins ofdifferent bacterial species. It comprises 45 amino acid residues andrepresents the first known example of contemporary module shuffling. Using1H NMR spectroscopy we have determined the solution structure of the GAmodule from protein PAB, a protein of the anaerobic human commensal andpathogen Peptostreptococcus magnus. This structure, the firstthree-dimensional structure of an albumin-binding protein domaindescribed, was shown to be composed of a left-handed three-helix-bundle.Sequence differences between GA modules with different affinities foralbumin indicated that a conserved region in the C-terminal part of thesecond helix and the flexible sequence between helices 2 and 3 couldcontribute to the albumin-binding activity. The effect on backbone amideproton exchange rates upon binding to albumin support this assumption. 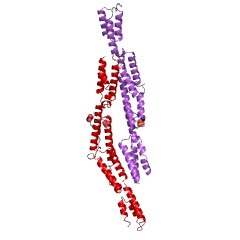 TheGA module has a fold that is strikingly similar to theimmunoglobulin-binding domains of staphylococcal protein A but it shows noresemblance to the fold shared by the immunoglobulin-binding domains ofstreptococcal protein G and peptostreptococcal protein L. When the genesequences, binding properties and thermal stability of these four domainsare analysed in relation to their global folds an evolutionary patternemerges. Thus, in the evolution of novel binding properties mutations areallowed only as long as the energetically favourable global fold ismaintained.